We offer a full line of ceremonial and graduation cords, tassels , Stoles, Sashes other celebratory items. Graduation Stoles and Sashes for Schools & Colleges. 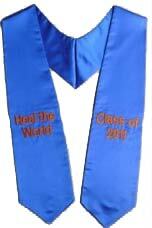 We supplies graduation sashes & graduation stoles for graduates to wear as a keepsake on graduation day. Order your custom graduation stole now. Fast Shipping. Plain Stoles available in more then 30 colors. All Plain Stoles orders are Delivered within 2-3 days from Order. Order Now ! Stole Details 61" Long All Together30.5" Long On Each Side5" Bottom Width Front Ends In Point Contours To BodyStole Fabric Light weight Polyester Shiny Satin Machine Woven 155 GSM Rich In Color.